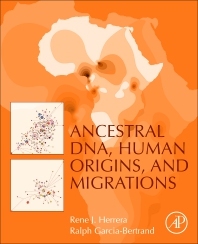 Ancestral DNA, Human Origins, and Migrations describes the genesis of humans in Africa and the subsequent story of how our species migrated to every corner of the globe. Different phases of this journey are presented in an integrative format with information from a number of disciplines, including population genetics, evolution, anthropology, archaeology, climatology, linguistics, art, music, folklore and history. This unique approach weaves a story that has synergistic impact in the clarity and level of understanding that will appeal to those researching, studying, and interested in population genetics, evolutionary biology, human migrations, and the beginnings of our species. Dr. Rene Herrera holds degrees from The City College of the City University of New York (BS), New York University (MS) and Fordham University (Ph.D). He continued his studies in molecular biology/genetic engineering as a post-doctoral associate at The Rockefeller University and New York Medical College. His areas of research include mechanisms underlying control of gene expression at the pre-mRNA splicing level, human evolution and human forensic DNA fingerprinting. He is a frequent contributor to journals in the field of human genetics. Dr. Herrera has established collaborative efforts with several leading scientists worldwide attesting to his philosophy of expanding the reaches of his research. His commitment to creating a professional foundation for future scientific generations has led him to contribute to the education of numerous students as a mentor. A total of 15 Ph.D. and 41 M.S. students obtained their degree under his supervision and hundreds of undergraduate students have benefited from his guidance in conducting research. He is an author of over 200 full length articles. Ralph Garcia-Bertrand is a Professor of Genetics in the Molecular Biology Department at Colorado College. He holds degrees from the University of Nevada (BS, MS), and The University of California, Riverside (PhD). He continued his studies as a post-doctoral fellow in the Department of Genetics, at the University of California, Berkeley. His research focuses on human population genetics and evolution. Dr. Garcia-Bertrand has won several teaching awards and has been the Director of undergraduate education programs funded by IBM, the Howard Hughes Medical Institute, and the Freeman Foundation. He has been a subcommittee member for various NIH research, educational, and underrepresented student programs for over 22 years. He is a lifetime member of the Society for the Advancement of Chicanos and Native Americans in Science, and the National Association of Biology Teachers. He teaches general and advanced genetics, human evolution, and a course on the ethics of genetics. Since the advent of archeogenetics, there has been a need for a book such as this: a summary of the current state of ancient human migrations. The information content in this volume is invaluable. "Some scholars even contest that this overall disinterest in Asian anthropology coupled with limited accessibility over the years since the original discoveries of Java Man and Peking Man in the later portion of the 19th and early part of the 20th century, respectively, have contributed to the greater number of discovered fossils and sites in Africa, shifting the interest and scientific opinion to the notion that the genus _Homo_ is of African origins and that Asia played little or no role." Even doctors of philosophy need editors.